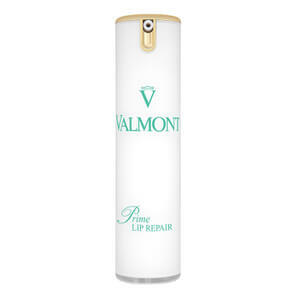 Nourish and protect your lips with Valmont Prime Lip Repair, an anti-ageing lip treatment specially formulated to treat delicate skin and promote a smoother, younger-looking pout. Combining pure nature with the power of science, the restorative formula utilises a Cellular Prime Complex to effectively smoothen the appearance of wrinkles and fine lines whilst restoring lips' natural fullness for supple, youthful-looking results. Helping to fight signs of ageing and the damaging effects of external factors, its synergy of Propolis and Avocado work in tandem to eradicate dryness and improve elasticity. After use, lips feel soft, moisturised and supple. Use Prime Lip Repair in the morning, at night, and several times throughout the day if necessary. Apply the product by dabbing it on and around the lips. For severe damage, apply a generous layer to the lips and leave on overnight.